A little while back I shared a traditional shepherd’s pie with lamb and a lovely horseradish mash. Today I’m mixing things up a bit with this vegan shepherd’s pie. If you’re a ‘meat-n-potatoes’ kinda person, honestly, you’re not gonna miss the meat at all! This one is super hearty and always hits the spot on a cold day….and we all need food like that this time of year, don’t we? 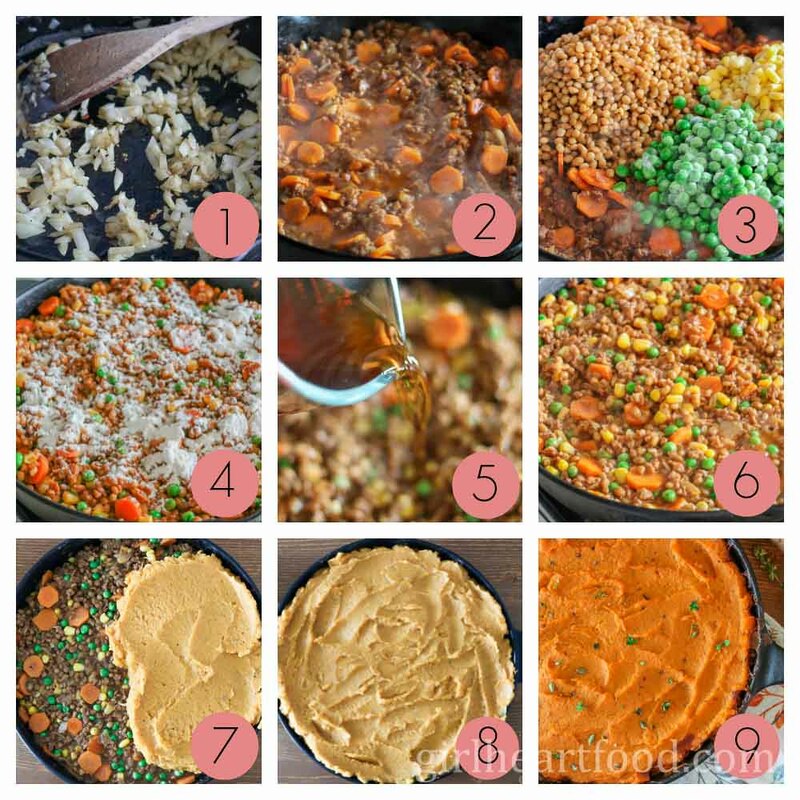 What Goes in a Vegan Shepherd’s Pie? For the ‘meaty’ component of this vegan shepherd’s pie I used a combination of lentils and a veggie ground round (‘Yves Veggie Ground Round’ (not sponsored, just a product I legit enjoy to use and eat)). You can find the ‘ground round’ in your grocery store typically where you would find tofu. The lentils and ground round really add a substantial base to this shepherd’s pie. Cook onions for a few minutes. Then, add garlic and cook for a minute. Add veggie ground round, carrots, thyme, stock, chili, salt and pepper. Bring to a simmer and cook for a few minutes until carrots start to get a lil’ tender. Add lentils, peas and corn. Pour over remaining stock and cook for a a couple minutes. 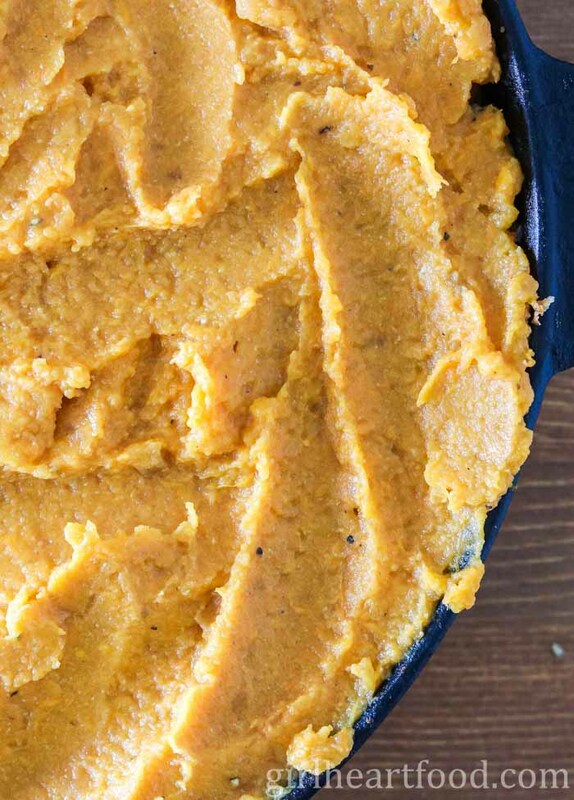 Spread sweet potato mash over top and bake! I love to have some textural interest to the sweet potato mash, so I don’t smooth them out. Run a spoon over top so there’s peaks and valleys in the mash. I used sweet potato mash here, but you could use regular tatos if you like. Speaking of mash, I just used salt, pepper, nutmeg and almond milk If you want them a little richer, feel free to add a dab or two of vegan butter. I used mushroom broth here from dehydrated mushrooms. This really adds a rich punch of savoury flavour. All you do is soak about a cup of mushrooms in some water for about 15 minutes or so. Strain mushrooms and use stock. If you don’t have mushroom stock (or prefer not to use it), veggie stock always works good. Place a sheet pan under the cast iron pot when you bake this vegan shepherd’s pie. It will catch any mess that may bubble over. Ain’t nobody got time for cleaning a messy stove, am I right? Other veggies could be substituted or added to the mix, like celery or mushrooms. Don’t have sweet potato or prefer not to use? Try regular potato. Sub the mushroom stock with veggie stock. Hope you love this vegan shepherd’s pie as much as I do! 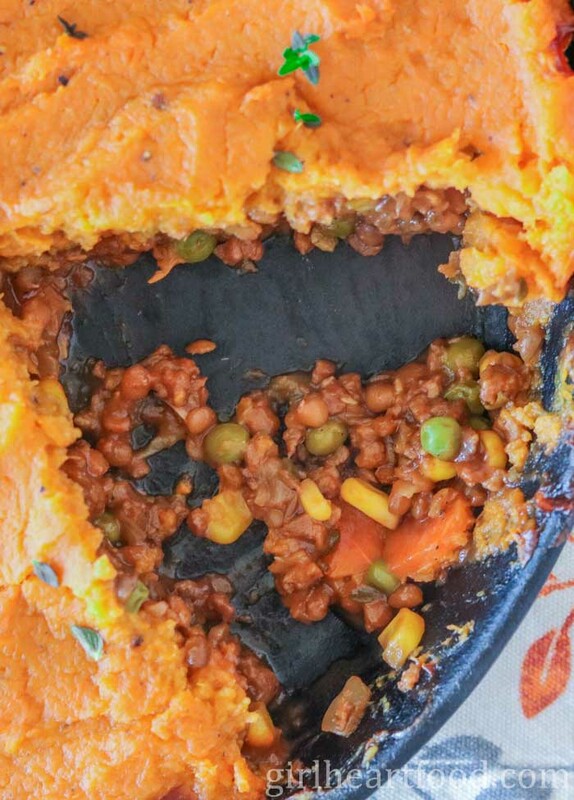 This super hearty Vegan Shepherd's Pie is packed with protein, fibre and veggies. It's baked up bubbling hot in a cast iron skillet for one comforting and delicious meal! Cook sweet potato in a pot of boiling salted water about 10 minute or until tender. Drain and lay to one side. Preheat oven to 375 F.
Meanwhile, in a 12 inch cast iron skillet on medium low heat oil. Add onion and cook 5 minutes, or until translucent. Add veggie ground round, carrot, thyme, chili flakes, 1/2 tsp of salt, 1/2 tsp black pepper, tomato paste and 1 cup of mushroom stock. Stir and bring to simmer and cook about 5-7 minutes or until most of the stock is absorbed. Stir in lentils, peas and corn. Gently sprinkle flour over top and stir in. Pour over remaining 1 cup of mushroom stock and stir to combine. Cook 2 minutes. Mix reserved sweet potatoes with almond milk, remaining 1/2 tsp of salt, remaining 1/4 tsp of black pepper and nutritional yeast. Spread over lentil mixture. Carefully place skillet on sheet pan (just in case there is bubbling over) and bake for 45 minutes. Let cool 15 minutes. Enjoy! Don't chop the carrots too thick because you want them to cook tender. I used sweet potato mash here, but you could use regular potatoes if you like. I used mushroom broth here from dehydrated mushrooms. This really adds a rich punch of savoury flavour. All you do is soak about a cup of mushrooms in some water for about 15 minutes or so. Strain mushrooms and use stock. If you don't have mushroom stock (or prefer not to use it), veggie stock always works good. Place a sheet pan under the cast iron pot when you bake this vegan shepherd's pie. It will catch any mess that may bubble over. I am most definitely a meat and potatoes kinda guy…but that doesn’t mean I can’t enjoy a good vegetarian (or in this case, vegan) dish. I love veggies! I also love that you topped this shepherd’s pie with mashed sweet potatoes. This sounds delicious! We’re in the process of moving this week. All the boxes are packed, and now we’re just making trip after trip (after trip)…let’s just say a nice dish of this shepherd’s pie would be quite welcome tonight! 🙂 Looks delicious, Dawn! I haven’t had Shepherd’s pie forever (two years for sure! ), so thank you for such a delicious reminder 🙂 I’ve tried a version topped with sweet potato mash, and I did like it probably even more than regular potatoes. But I’ve never tried a vegetable version. And while I normally don’t mind meat in my food, this meatless dish looks and sounds fantastic! Time to enjoy some, then 😉 It’s quite delish, if I do say so! Thank Ben. Hope you’re having a great weekend! This looks so hearty and comforting, Dawn! It may be vegan, but it looks like it would satisfy every bit as much as meaty versions! I think so too 😉 Thank you Marissa! Lol! Thanks a million, Kelly! You too :)! This is fabulous. I’d forgotten that I have used sweet potatoes to top a shepherd’s pie, although not a vegan one. Sweet potatoes are really wonderful. And pretty! 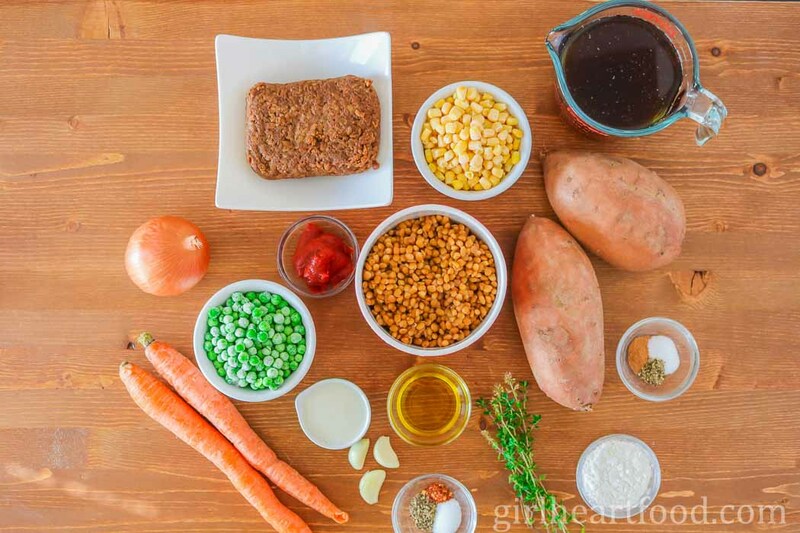 Dawn – I love shepherd’s pie, I’ve made it with Sweet potatoes before, and I think it’s totally the way to go – so so good! I haven’t used this type of protein before, but am game to try it. Always nice to have a vegan recipe for a hearty (meat) dish! It really is a yummy protein! Hope you get a chance to try it out soon 🙂 Thanks Laura! 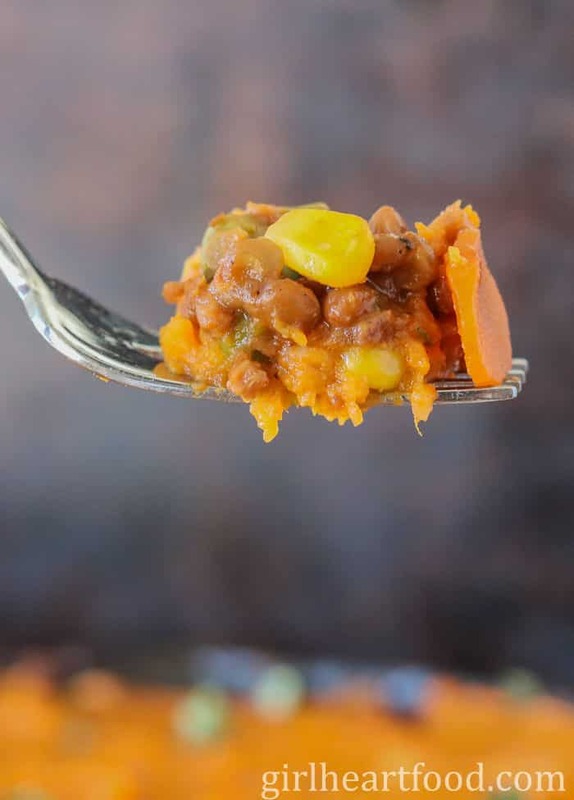 What a great twist on traditional Shepherd’s pie – never thought to use sweet potatoes! Such a filly and hearty comfort food for these winter days! I love the sound of this, Dawn!! Especially that mushroom broth! YUM!!! I love mushrooms. This sounds so perfectly hearty and comforting – I know I wouldn’t miss the meat at all!! Such a comforting winter dish Dawn! And loaded with all the healthy things! Count me in. Pinned! I sure will 😉 Thank you Mary Ann! I love that you used sweet potatoes as a topper. Not only does it look fabulous but I’m sure it tastes fabulous. This does look like a hearty meal to serve during these winter months! As January drags into its 100th day, I need all the comfort food I can get!! And since this one is vegan, I know it’s going to have all the comfort without that heavy feeling. Love the sweet potatoes on top! I’m imagining this bubbling up in my oven for dinner some time soon! Pinning for sure! Yum! I can’t see why one wouldn’t miss the meat. 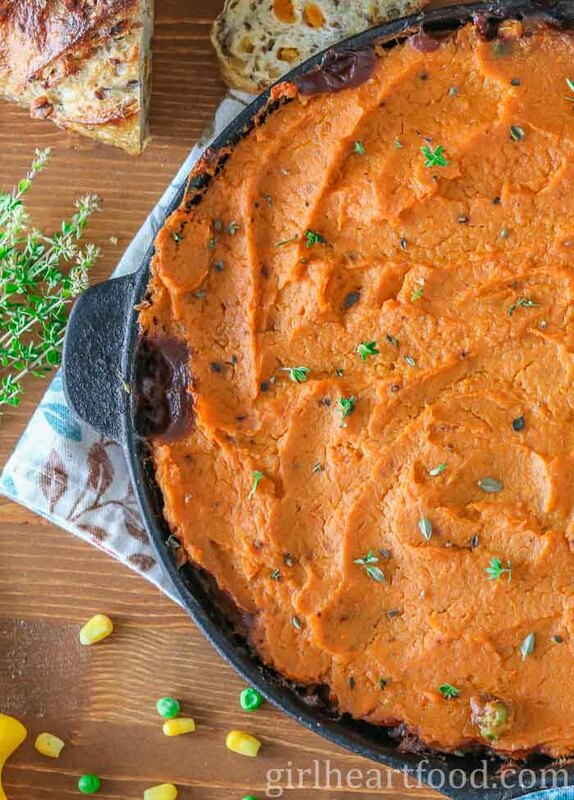 All of the ingredients are so flavorful and with the sweet potato, oh my. I love it! This is exactly what I think we’re all craving when it’s cooler out. So happy to hear that! Thank you Valentina 🙂 Happy Monday! This looks AWESOME, Dawn! I love every single ingredient you used, and I’m especially excited about the sweet potatoes on top. What a fun twist on a classic! Hope you have a great week!